The weather was dry, and the race was fast. 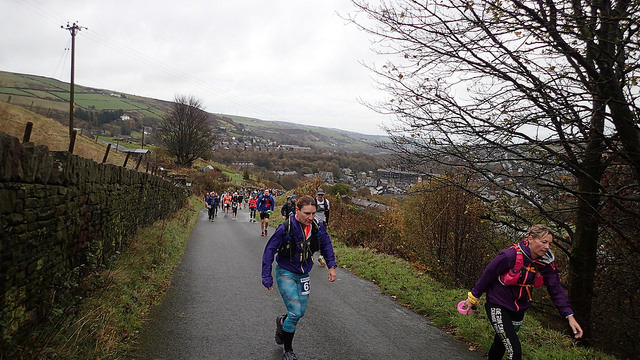 It was hilly, but with a fair bit of tarmac, and much of the rest on good tracks, it was very runnable. I spent the morning sorting out the Jedburgh results, & didn’t get to Marsden until the first few runners had already finished. Remember we were giving Runfurther points for runners in the 60-mile and 100-mile races as well, using the 30-mile times from their trackers. 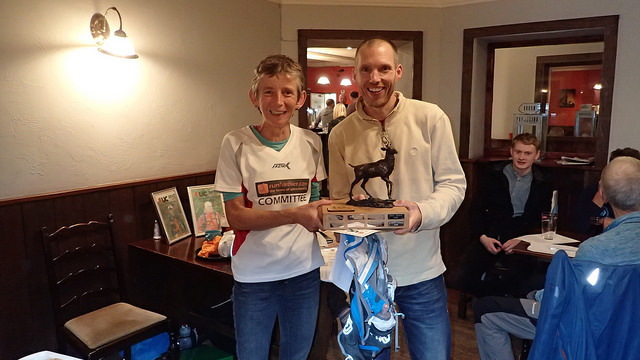 First home was Rory Harris in 3:56:42, with Lee Kemp just behind in 3:58:15. 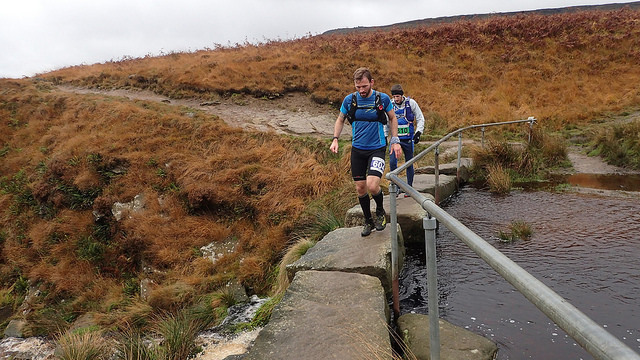 Third runner to get back to Marsden was Cees van der Land, in 4:05:08, but he went straight back out for another lap, eventually winning the 60-mile race. 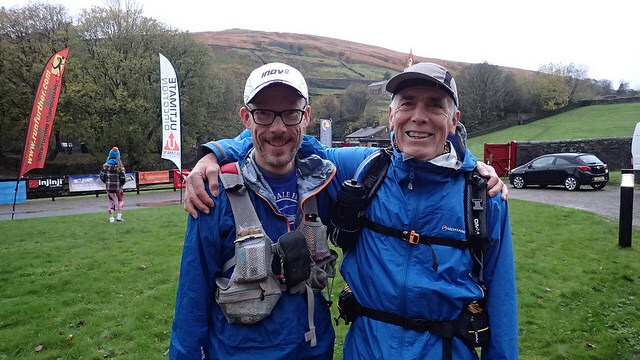 The head to head between Ken Sutor and Kevin Hoult was settled when Ken finished next in 4:07:53. 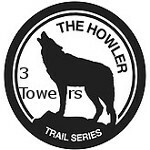 Kevin had entered the 100-mile race: he finished the first lap in 4:14:00, but retired at that point. 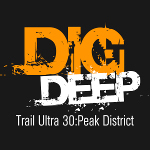 First woman was Kim Kennedy in 5:03:28, 2nd was Helen Morley, only 2o seconds behind. Helen Pickford was next through in 5:11:30, on her way to 3rd place overall in the 60-mile race. Lesley Murphy was next in 5:17:53. Karen Nash finished in considerable pain exactly a minute after Lesley, & clearly needs to get her foot sorted out! 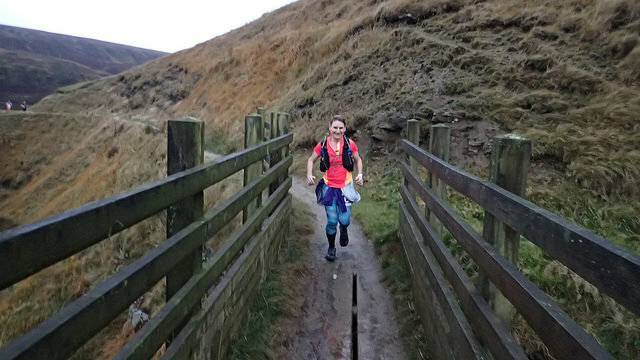 Karen has written her race up, and you can find that on her blog here. 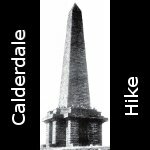 Nick’s photos are on Flickr here, & I’ve pinched some of the for this post. You can find the full race results on the White Rose website here. 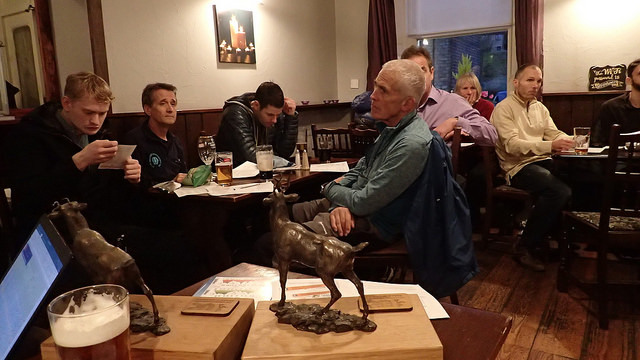 Ken Sutor, Cheshire Hash House Harriers. Well done to Ken. He beat Kevin Hoult in all 3 of their Runfurther head-to-heads this year, so is a worthy winner. 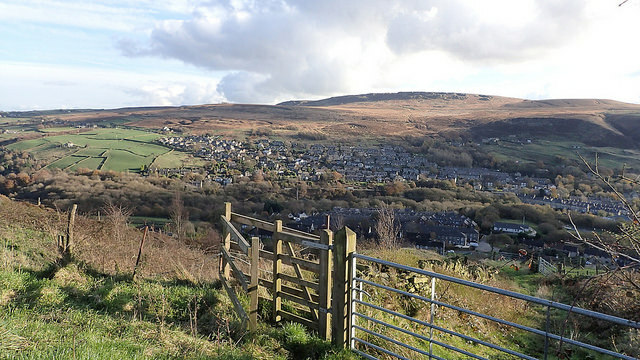 Kevin Hoult, Calder Valley FR. Last year’s winner, but not quite fast enough to repeat that this year. Rory Harris. Rory’s definitely one to watch for 2018. All 3 runners were way ahead of the rest of the field this year, but quite close together. Rory could have taken the title had he run another Long race & replaced his Fellsman points with a higher score. Adam Worrallo, Bingley Harriers. David & Adam were only separated by 5 points. Karen Nash, again. A running machine, and it’s about time she got some more competition! 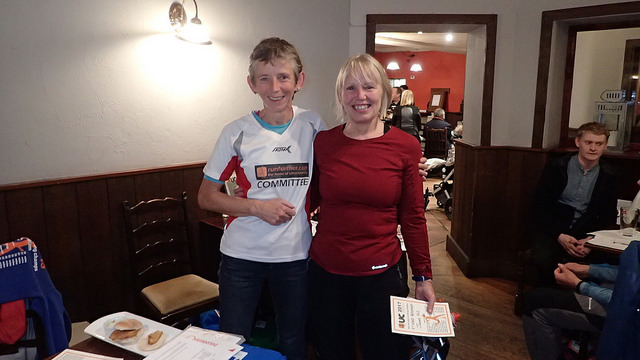 Debbie Cooper, Lytham St Annes Road Runners. Settled by her run at Jedburgh. Sarah Smith, Valley Striders AC. Martin Terry, Clayton-le-Moors Harriers. Looks like this one’s Martin’s until he’s 60, at this rate! Kevin Smith. Kevin was only 2 points behind Nick. Bob Nash, the first over 70 to achieve this – an amazing result. Nick Ham, & not for the first time. Congratulations to both of them. Well I’m not going to give a blow-by-blow account of the AGM, which was brief as usual. The main item was my standing down as Assistant Secretary, and Kevin Smith volunteering to join the committee in my place. I’ll continue to run the website & turn race results into Runfurther points though – who else is daft enough to do it? Anyway, the AGM minutes are here. As for the presentations, I’ve already listed who won what above, so here are a few of Nick photos of the presentations. The rest are on his Flickr site here. 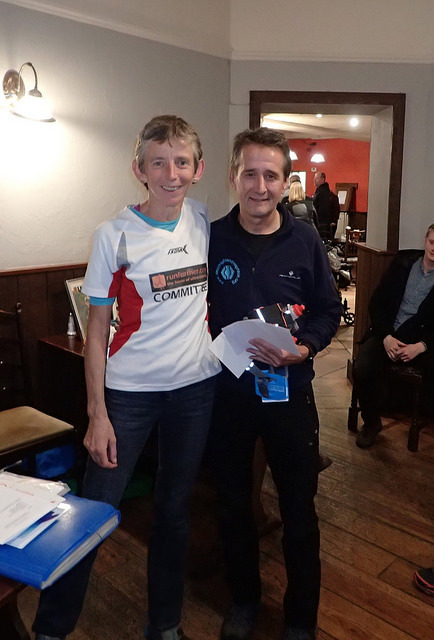 Lastly, many thanks to Karen for holding everything together so well this year, and to Si Berry and Lee Kemp for turning up in Marsden with gifts for all from Ultimate Direction and Injinji. We just need Lee to run a few more Runfurther races next year now, to give Ken, Kevin & Rory more to aim at!